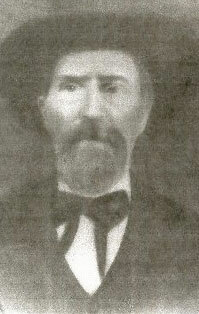 John R Campbell was born about 1839. He married Jane Catharine Blevins and had three children: Flora Ann, born 22 August 1857; Sarah Taylor, born 29 March 1859; and John Nathaniel, born 2 March 1863. After Jane's death on 6 March 1863, he married Rachel Blevins on 23 November 1864. They would have six children: General Strate, born 20 December 1865; Bird Sherman, born 26 January 1868; Lucretia, born 4 August 1871; Susanah Elizebeth, born 3 April 1876; Alexander, born 8 May 1878; and Henry Jackson, born 18 October 1880. John Campbell died 28 October 1908. Picture submitted by Brad Campbell.